Oh, and there’s one thing I will never ever do: I will never pose with clothes on! I am a diva, after all. Nora, we agree you do look best at your piano as we do simply soaking the sun into our black furs, but we felines need to also show others we make the world astonishingly beautiful simply by being in it. And if that means posing with a mandarin orange, or a couple of green apples, or other things our humans find inspiring, it’s all to our benefit for our entire species. We think you look lovely, and that mandarin orange ought to be darned glad. And please do keep your pledge never to wear…clothing. 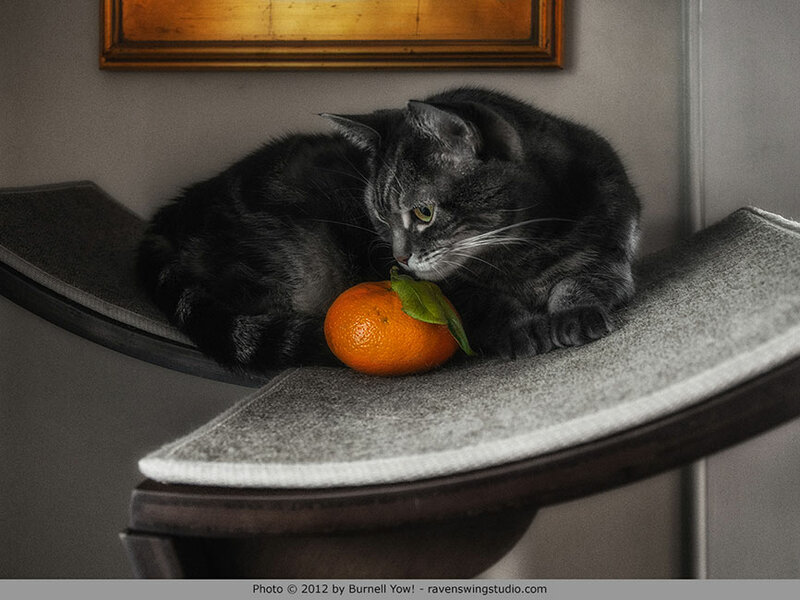 I love the photo of you with the orange, Nora! And I am glad to know you are sticking to your principles and not allowing clothes-on modeling. I get forced into doing it sometimes and I always feel sleazy afterwards. Nora, I think you look especially beautiful in your most recent photo! You look beautiful, Nora! The Diva strikes again! Nora… any pose or photo would look awesome! Cats are beautiful no matter what!! Nora you looked like you’re deep in thought, perhaps composing a new concerto. A tangerine could never detract from your beauty…this one enhances you.Yes, dear one, this is indeed art. Nora, the orange colouring makes your coat look even more gorgeous, if that is possible. So, I vote yes on the ‘art photography’ – it enhances your beauty and makes your personal assistant happy. Almost perfect! Hello, Nora … It’s been a few years since I’ve visited your website and am happy to know you are doing well. I love the pic of you with the “m. orange” …. it makes your beautiful coat stand out. You have such a sweet face and it reminds me of my soon-to-be 4 yr. old boy at home… Scamp. I hope you continue to bring pleasure to many. Have a great life. maybe Burnell and Betsy are trying to inspire you to play Prokofieff’s :ove for the Three Oranges. Beginning slowly with one to see how you are inspired.